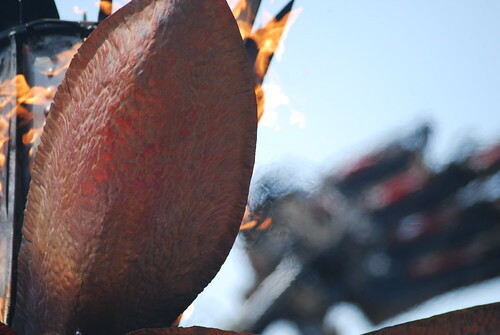 One of my favourite parts of Maker Faire is the fire art, where metal and flame come together in a symphony of heat. This year the highlight was a spinning chimney in the heart of a metal flower, lit by propane roses. Every so often it would erupt in a gout of flame, a fireball of beauty. 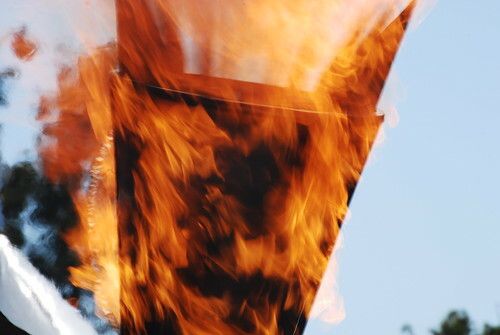 The flames and the heat distortion made it an ideal subject for photography, dropping the shutter speed a little to capture the spinning heat driven motion of the sculpture's central chimney.